Maps and newspapers, because they’re rich in graphic information, benefit greatly from a zooming and panning interface. Text-only books, because they’re more linear and because text is easily searchable, don’t benefit from this sort of interface as much, but books with pictures certainly do. zKimmer.com has recently implemented Google Maps technology for viewing non-map text and picture resources, such as magazines and newspapers, which are converted from PDF format. This is an exciting development especially because it holds promise that the same sort of technology could also be used for books. With Google’s great success using a zooming-panning interface in Google Maps, and having recently launched Google Newspapers which also uses it, the question naturally occurs — Will Google developers sooner or later also use it for Google Books? The zKimmer screen-shots above are from a magazine (though they could easily be from a book) and those below are from a newspaper. They both show how this interface facilitates navigating a resource that includes extensive pictures as well as text. zKimmer lacks a good search capability (it has a search box, but it doesn’t seem to work) — So it’s not ready for heavy-duty enterprise use — It’s exciting, though, because it shows the potential value of a zooming-panning interface for books. Google Books already uses panning and zooming in a limited way, for navigating between pages, but a multi-page pan and zoom, as in zKimmer, would greatly simplify picture and text navigation. Other implementations of the Google Maps API for non-map graphic resources are a desktop collection of elegant books by the reclusive German techno-artist Markus Dressen, and a card set from the World Of Warcraft. Posted in eBooks, Google, Google Book Search, Magazines, Maps, Navigation, Newspapers, PicsYes, Uncategorized, Zooming & panning. Looking at Google Newspapers has got me thinking that the same sort of zooming-panning interface that’s used in that, and in Google Maps, could also be used for viewing books. An example of this is shown in the screenshots from videos on Seadragon linked below. Seadragon is a zooming-panning technology, owned by Microsoft, and used as a component in other tools, such as PhotoZoom, Silverlight, Photosynth, and various Microsoft mapping applications. When it was acquired by Microsoft in 2007 it got attention as a powerful component of other Microsoft applications, but I haven’t seen it featured as a potential interface design tool for ebooks. This is a relatively small part of the videos below, but the screenshots give a feel for it. 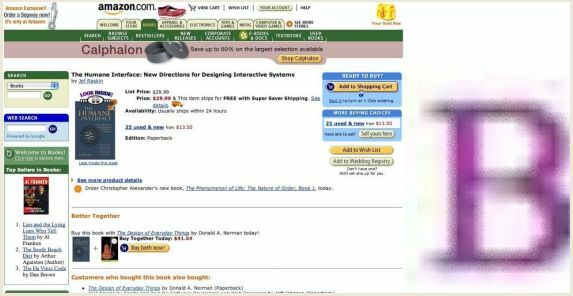 These are from two different videos, both showing how the system can be used to zoom in on pages from a book. The sequence above, which is made up of 800 images from a map collection at the Library of Congress, shows how easy it is to zoom in to find pages that have text and pictures together. This video (2:13) is made by the company from which Microsoft bought Seadragon. The second sequence is from a video (7:42, the first 2:50 on Seadragon) of a talk by Blaise Aguera, the creator of Seadragon. As indicated, it shows zooming in on a large text source. Both of these videos emphasize the obvious usefulness of Seadragon technology for mapping applications. But they also show that it has potential usefulness for viewing online e-books — So it’s too bad Microsoft dropped out of the Internet Archive digitization project in May, 2008! Posted in eBooks, Maps, Microsoft, Navigation, PicsYes, Seadragon, Uncategorized, Zooming & panning. A useful thread in exploring panning and zooming is the concept of the zooming user interface (ZUI). Demos of this are especially valuable because they give a detailed view of the power of panning and zooming for navigating an online environment that integrates text and pictures. An elegant example of this is illustrated in the demo from the Raskin Center, shown in the screen-shots below. Note here in the intro screen (above) that it’s so easy to see where pictures and text are that the large print labels (Pictures, Documents) are really unnecessary. After getting used to the idea that small chunks of text can quickly be zoomed to a readable size, it’s easy to move around the environment. 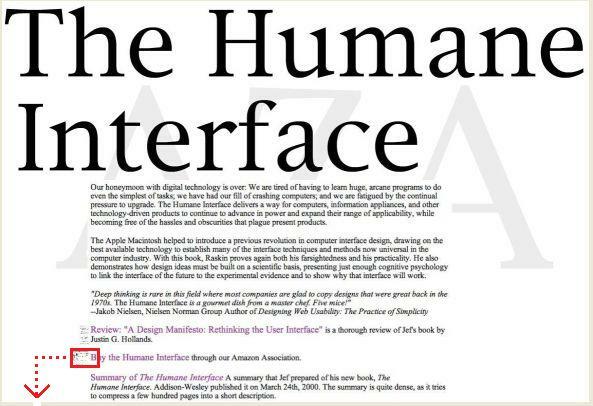 From the intro screen, the Human Interface box is zoomed to the the size below. The second and third screen-shots (above and below) especially show the power of this sort of interface to integrate pictures and text — The tiny “thumbnail” picture of the Amazon.com page in the screen-shot above zooms to the full-sized page in the screen-shot below. For more – WikiPedia : Zooming user interface has good links to examples of ZUI’s. Posted in Navigation, PicsYes, Uncategorized, Zooming & panning. 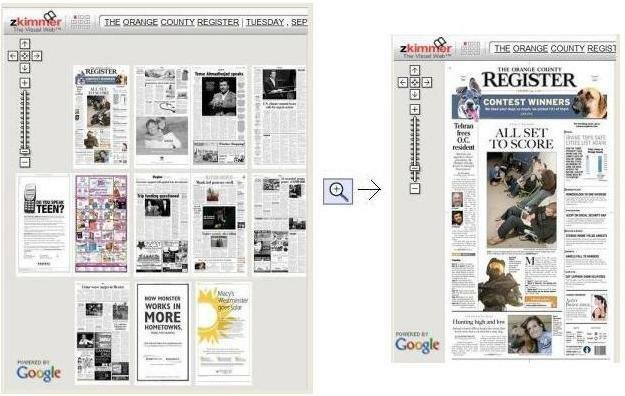 Google recently announced the launch of Google Newspapers. 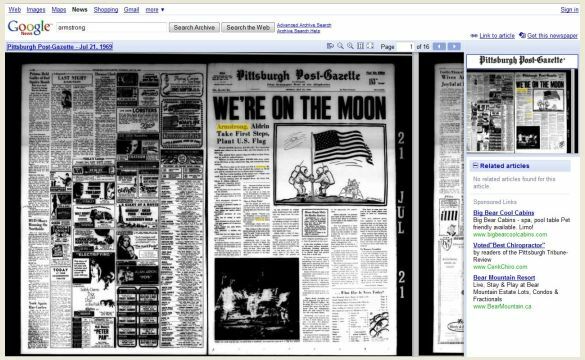 The first issue (and apparently the only one up currently) is the 1969 We’re on the moon edition of the Pittsburgh Post-Gazette. What caught my attention here is the ability to pan — to move around on the large newspaper page with the mouse by dragging the hand pointer. Use of mouse panning was introduced with Google Maps, and likely played a large part in its becoming so popular. Like a map, a newspaper page poses the same kind of challenge — How to design user navigation for information covering a large surface. As with Google Maps, here also it looks like Google Newspapers has set the standard for navigation of a large-paged information source, especially one with pictures. Panning (and zooming, which is often discussed together with it) provide an interesting and challenging concept to search, because the words are in prominent use in other contexts, especially photography and video. Surprisingly, there’s no article in Wikipedia for the concept of panning as used for computer information navigation. An elegant demonstration of panning is at the Hubble pan and zoom gallery. Posted in Google, Navigation, Newspapers, PicsYes, Uncategorized, Zooming & panning.